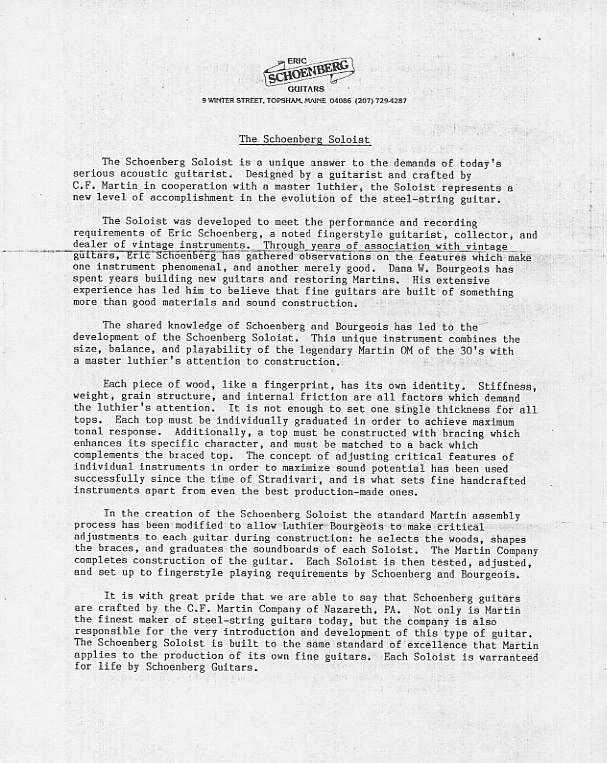 The revised Schoenberg Soloist prospectus. 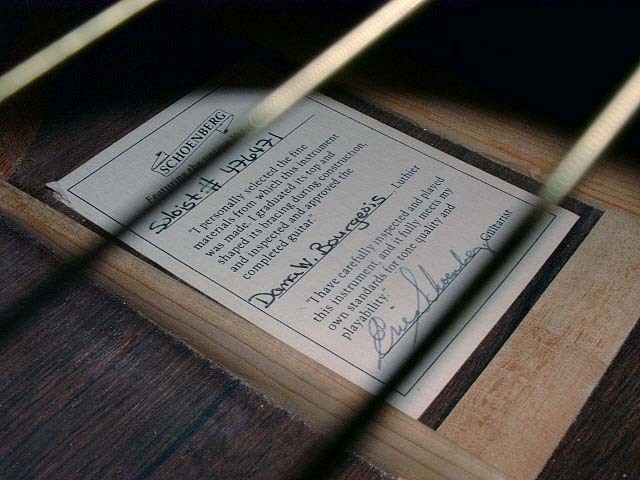 Dana Bourgeois, built approximately 100 Schoenberg guitars (about seven batches) at his shop in Topsham, Maine, traveling to voice the tops at the C. F. Martin & Company plant in Nazareth. 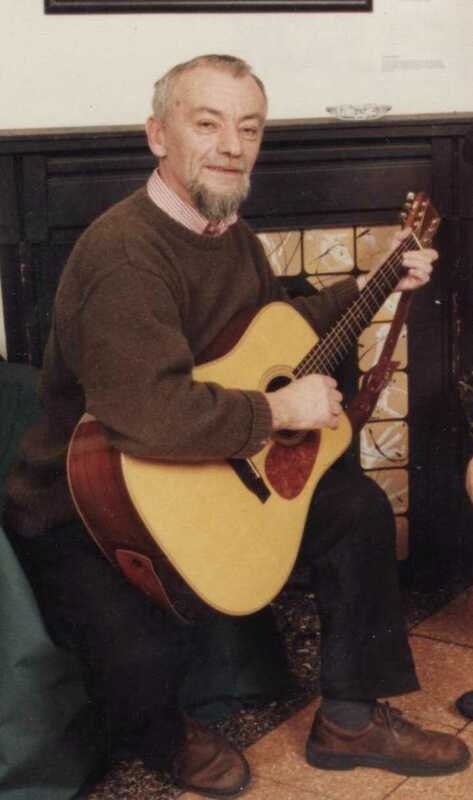 Throughout 1987 and 1988, Dana was assisted by his second apprentice, Ted Schieps (a jazz guitarist now living in France), who had taken over from T. J. Thompson, Dana's former apprentice (and, by now, Repair Shop Foreman at Elderly Instruments in Lansing, Michigan). As Dana recalls, "I built guitars in runs of 10, 15, or 20 at a time. I selected all of the materials, made up most of the parts in my shop, and essentially sent guitar kits to Martin to assemble for us. During construction I went to the Martin plant and voiced each soundboard, making minute gradations based upon what I heard". 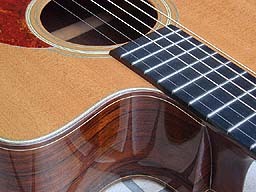 The idea was that Dana's individualized tap-tuning, or 'voicing', of the guitar tops during the Martin production process would enhance the instruments' handmade quality. Selection of back & side woods. Matching of tops and backs. Side bending (from 1989 on). 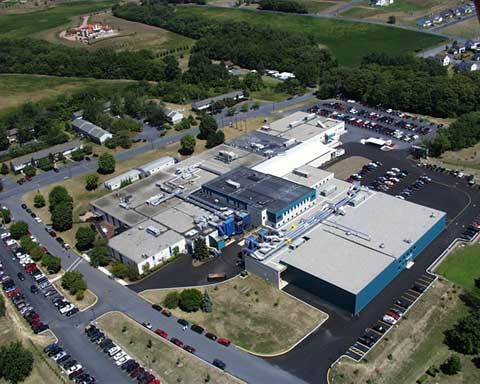 Top voicing (aka tap tuning) --at C. F. Martin & Company in Nazareth, Pennsylvania. Hand bending of sides (prior to 1989). Neck carving (from special template provided by Bourgeois). 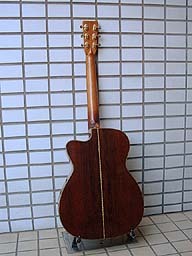 Neck set (with average bridge height specified by Bourgeois). 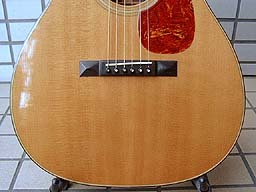 Application of standard lacquer finish. 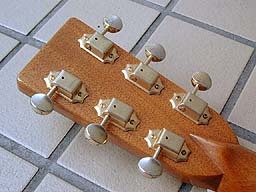 Installation of standard Grover tuners. C. F. Martin & Company serial number applied on brass plate on neck block. 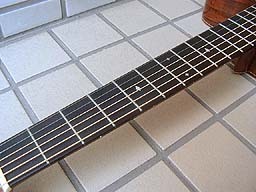 "T" frets (not bar frets). 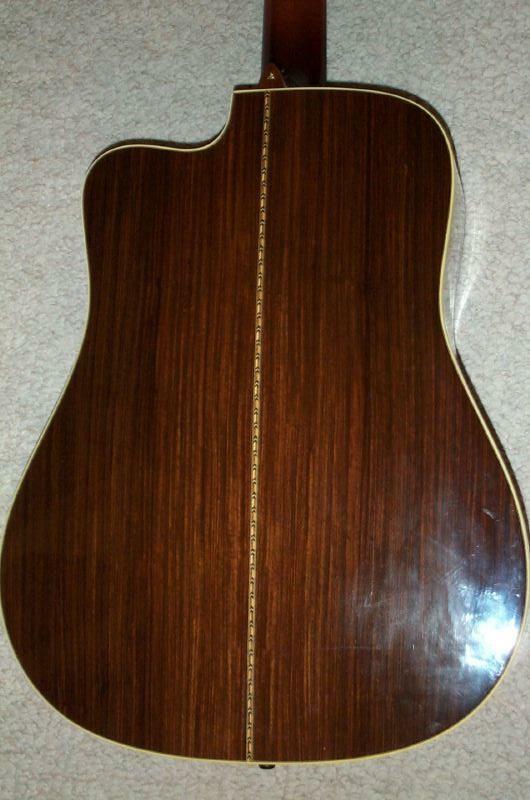 Brazilian Rosewood was standard for the back and sides. 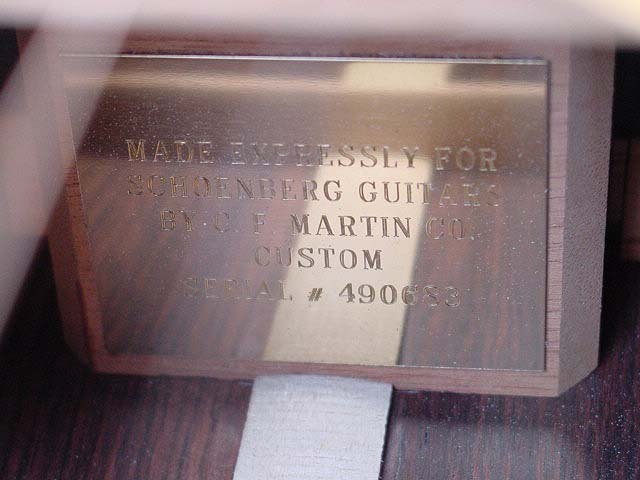 Upon completion, each Schoenberg Soloist carried an engraved plaque inside stating, "Made expressly for Schoenberg Guitars by C. F. Martin Co.", followed by a Martin serial number. 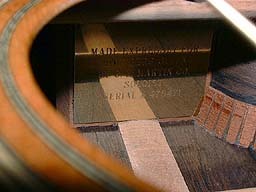 Never before had Martin been so straightforward about their manufacturing input into instruments bearing another name. 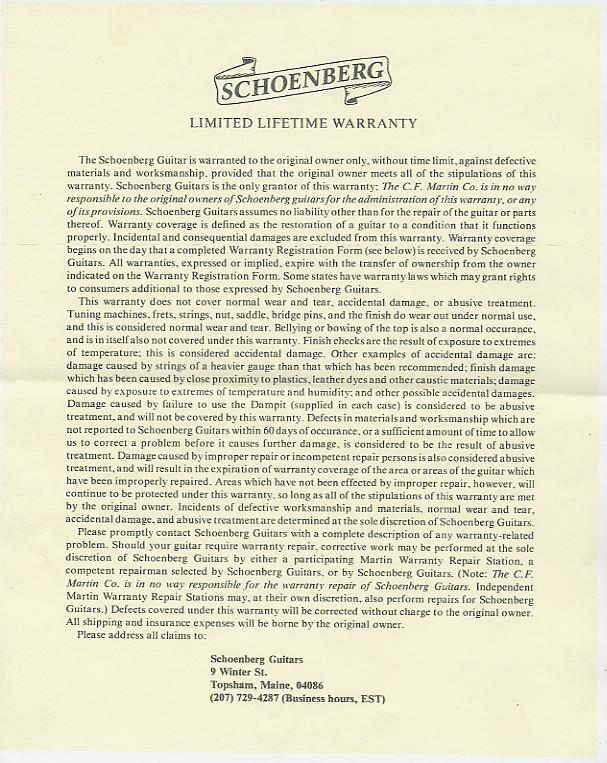 The guitars also bore an internal label signed by both Schoenberg and Bourgeois. 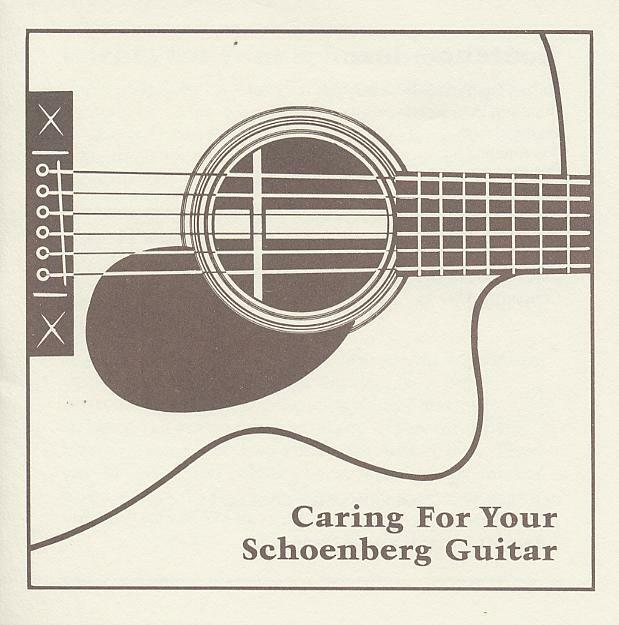 ("Featuring the unique Voiced Top" is obscured by a string beneath the Schoenberg logo). 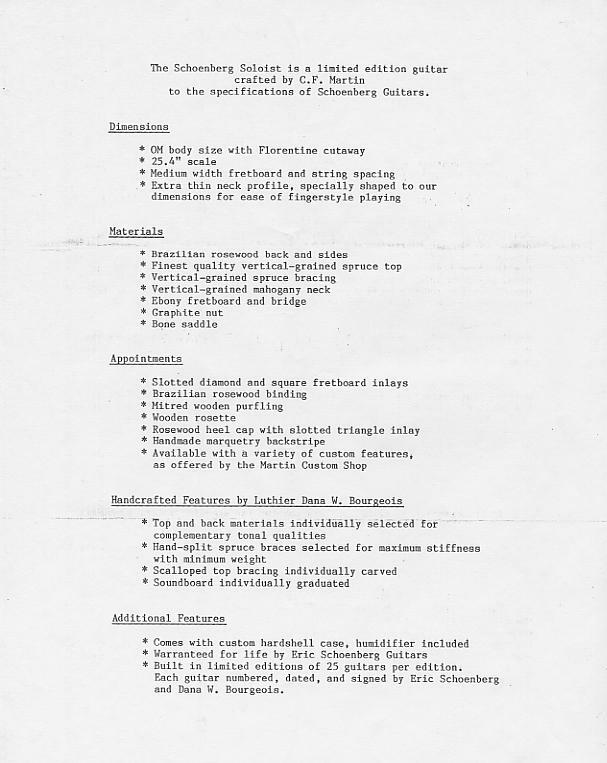 "Care and Feeding" booklet that accompanied each Soloist. 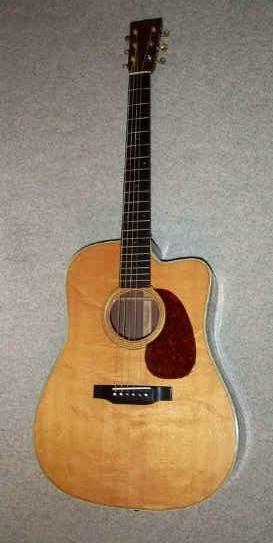 Dana Bourgeois was a 'fan' of Martin D size guitars, and personally owned a 1953 Martin D-28 with an Englemann Spruce top. 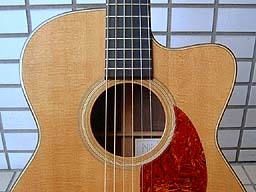 Thus, although the vast majority of Soloists are OM cutaways, serial # 472,277 was a D, or Dreadnought, size, and # 474,751 was a cutaway D.
Another D cutaway was built with a German Spruce top, Brazilian Rosewood back and sides, Martin style "42" inlays, and a Maple neck. 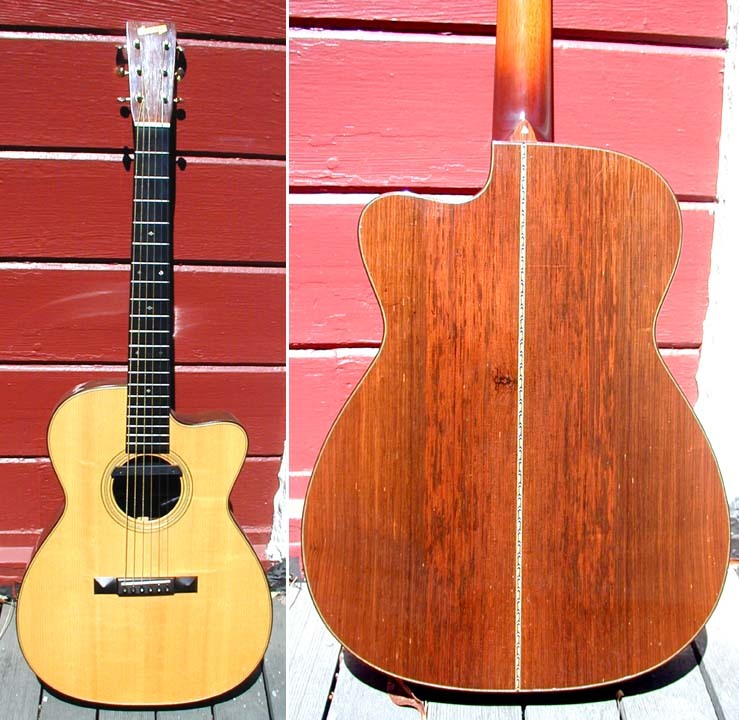 This guitar was loaned to Bluegrass guitarist Tony Rice, who 'rejected' it simply because he did not like cutaways. 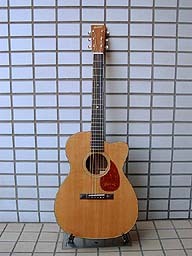 Dana Bourgeois kept it, and later sold it to Jack Beck, acclaimed Scottish folk-singer. Its serial number is 482,966. Jack Beck and Dana Bourgeois in Maine c. 1990. Jack Beck playing his D cutaway Soloist.